조선조 학자인 금계노인(1566∼1623)이 정유재란 때 남원성의 전투에서 왜병에게 붙잡혀 일본에서 2년동안 포로생활을 하다가 명나라 사절단의 배로 도주하여 북경을 거쳐 귀국하게 된 경위를 쓴 일기문으로, 선조 32년(1599) 2월 22일부터 같은 해 6월 27일까지 약 4개월간의 기록을 담고 있다. 노인 금계일기(魯認 錦溪日記)는 고향인 나주에 있을 때 임진왜란이 터지자 권율장군의 밑에서 의병으로 활동하였다. 일본군에 잡혀 포로가 되었으나, 간신히 탈출하여 후에는 일본에 대한 복수책을 명나라에 알려주는 일을 했다. 이 일기는 책의 앞뒤가 없어지고 글씨도 많이 훼손되어 읽기가 매우 힘들어 대체적인 정황만 알 수 있는데 남원성 전투에서 왜병에게 붙잡힌 경위부터 귀향 때까지 기록이었으나, 내용의 앞뒤가 유실되고 그 일부만 남았다. 그가 죽은 후 200여년이 지나고 그의 7대 후손들의 노력으로 만들어진 노인의 시문과 함께『금계집』속에 이 사실이 수록되어 있다. 더욱이 중국에 머무는 동안 그곳의 학자들과 만나서 그들의 질문에 따라 한국의 교육, 과거, 재정, 군사, 문화, 풍속 등 여러 가지에 대해 상세히 설명해준 것이 일기에 쓰여있어 시대상황과 정황을 살필 수 있는 중요한 자료이다. 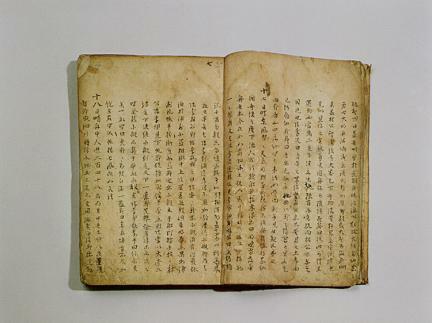 The diary of No In (1566-1623), a scholar in Joseon with the pen name Geumgye, was written over a period of 4 months, from February 22 to June 27 in 1599, the 32nd year of the reign of King Seonjo, when he was returning to Joseon from Ming after 2 years of captivity in Japan. He was in Naju, his hometown when the Japanese Invasion of Korea occurred in 1592, and he served as a soldier under General Gwon Yul. He was captured in the Siege of Namwon and taken to Japan as a POW, but successfully escaped on a ship of the Chinese delegation. The front and the back parts of the diary are missing, and letters have been erased so the diary is hard to read. The facts can be found in the Geumgyejip, which his 7th generation descendants made 200 years after his death. It also contains information on the education, civil servant examination, military, finance, culture and customs of Joseon, in the form of answers to questions put by Chinese scholars while he was staying in China. Accordingly, it is an important source for studying the state of the period.